One Champion asks, “Is there is any better weather ever for sleeping?” The reprieve by the rain from outside chores, the perfect temperature, the soft quality of the morning light and the comfort of the sheets all invite the drowsy pensioner to linger. Those first thoughts of the day savored in the luxury of sloth: “How green is my valley!” Champions have plenty to do inside as well, so they are up and at it. Friday night was damp for the Up and At It 4-H picnic, but it was reported widely that Saturday night was good. Good food, good music and good fellowship are the hallmarks of this annual event. Everybody has a good time. The year goes by so quickly, if you missed this one, the next one is just around the corner. Meanwhile the 4-H kids benefit year around from this fund raiser and their Champion friends wish them every good success in their endeavors. Leadership programs in the 4-H Club prepare young people to step up to the challenges in their community and the world. Head, heart, hands and health—Champion! 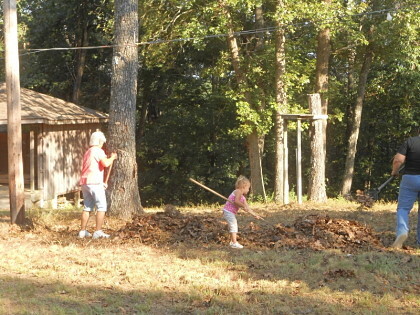 Miley Day Schober was around every corner with her rake on Wednesday helping her grandmother and the other Skyline Auxiliary members get the picnic grounds ready for the big happening. Miley Day Schober worked with her grandmother and other members of the Auxiliary to get the picnic grounds ready for the Skyline VFD Picnic on the 9th and 10th of August. Wednesday evenings are dedicated to picnic preparedness and Miley is an enthusiastic participant. Her family has a long history with the Skyline VFD back to its very beginnings. It is a fine thing to see individuals willing to work as a group for the benefit of the whole community. A man named Edmund Hale said, “I am only one, but still I am one. I cannot do everything, but still I can do something; and because I cannot do everything, I will not refuse to do something that I can do.” That is a mouthful and a great Champion sentiment. A phone visit with Irene Dooms lets Auxiliary members know that she will be at the picnic with some coconut cream pies made from her sister’s receipt. She allows that her pies will probably not be as good as Esther’s but she wanted to keep the tradition going. Her pies will rival any that the generous membership can contribute. Everyone will look forward to a mouthful of that goodness. Irene and Esther’s old family home place is still in the family and a year or so ago was seriously threated by a grass/brush fire that jumped the road. She was so grateful that the Skyline firefighters were willing to take her gate down and get it put out before the fire took the whole place. Her membership in the fire department and a few scrumptious pies express her gratitude. She is a Champion. Last Tuesday morning very early the wind blew a tree down in the Mountain Grove apartment complex where Ruby Proctor lives. 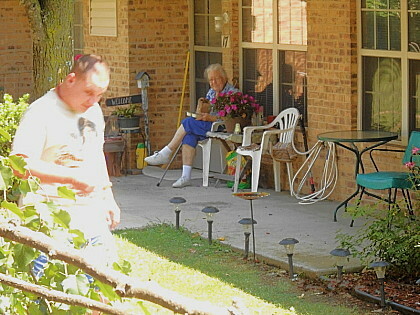 Ruby looks on as a neighbor examines the downed tree in front of her apartment in Mountain Grove. The wind of early Tuesday morning brought the big multi trunked tree down without doing any damage to nearby structures. The tree did not hit her house, but it came close to her sister Amy’s place and made a mess in the yard for a little while. Amy has some beautiful flowers that the tree top missed as it thrashed and crashed almost to her door. A luscious double begonia in a color somewhere between tangerine and orange survived nicely on its shepherd’s hook by her walk way. Across the courtyard, Ruby has some beautiful roses and a petunia planter that is just exquisite. It was a lovely morning for a pleasant visit out on the porch. Ruby always thinks of Champion as her home. She grew up right in the heart of the place and the place is much in her heart. She was pleased to hear that Lorene Johnston’s notebooks are being enjoyed. Lorene was Ruby’s husband’s niece, so Ruby is well acquainted with Lorene’s long time habit of conserving things of interest. She would certainly have clipped out a newspaper picture of the tree down in front of Ruby’s place. Champions are all relaxed and smiling as the green beans go in the jars and the tomatoes begin to ripen. A vigilant eye is directed toward the corn patch lest the raccoons decide on an early feast. Linda’s almanac from over at The Plant Place in Norwood says that the 30th and the 31st of July will be good days for planting root crops and for transplanting. Likewise the 1st of August and the 4th and 5th will be good for root crops and for starting seedbeds. The joys of the garden are many! Hopefully Taegan (Peanut) Krider will be down on the Square in Champion on Friday and Saturday with some of her Dad’s extra zucchini. Several young families will be down there for an informal swap meet then. It is reminiscent of the old days when the square would be full people catching up on the news of the week and seeing what people had brought to sell and barter. Those were the days before the internet and television. There were phones then, but not nearly everyone had one, so they would just head on down to Champion with their eggs, or rabbits, or fish, or extra green beans and would come home with a needed tool, or some dishes or something nice from someone else’s closet. It is a lively community yet—Champion! Tennessee family and friends have graced the place with warm smiles, wholehearted handshakes and hugs, and beautiful singing. They were well met and will be always welcomed. Birthdays for early August include Seamus Heffern and Skyline School bus driver Paul Kennedy. They both celebrate on August second. Seamus lives in Springfield but has recently spent some of the best part of his summer vacation with his grandparents just over in Champion South. He and his little sister, Lizzy, and the new puppy, Skooter, romped and played until the grandparents were exhausted—in a good way. Walter Pidgeon and Maureen O’Hara were the stars in John Ford’s 1941 movie. The protagonist said, “How green was my valley that day, too green and bright in the sun!” So it was not a question but an expletive. Richard Liewellyn’s 1939 novel ended with, “How green was my Valley then, and the Valley of them that have gone.” It is easy to look at a place full and vibrant with life and yet see the shadows of dear ones, gone, moving through memory in the intervals of present business. So it is in this valley. The many songs about valleys often have references to old and new loves, sweet and sad. “I’ve got a mountain of love for the girl in the valley. I’ve got an ocean of dreams for the girl in the valley.” Share your favorite at Champion at getgoin.net or Champion Items, Rt. 2, Box 367, Norwood, Mo 65717. Come down to a beautiful valley, at the bottom of several hills, at the junction of country roads and the beginning of the pavement, just down from the joining of Clever Creek to Old Fox Creek where stands the Recreation of the Historic Emporium over on the North Side of the Square. You may stand in the lovely lanai there to sing your favorite valley song or just look out across one of the world’s most charming valleys–Champion—Looking on the Bright Side! Champions arose from their comfortable beds early on Monday morning and went out to inspect their rain gauges and varmint traps and to marvel at their good fortune. It would seem that the dry spell is, for the moment, broken and there is every chance that this will turn out to be the growing season which will be remembered into distant decrepitude as having been the start of all the great ones. “Don’t tell me 13 is an unlucky number! Don-cha remember? 2013 was the year we ran out of fruit jars!“ It is a marvel that a person can fanaticize about a marital spat many years hence. Champion! A bunch of good citizens—community minded folks—got together Wednesday at the Skyline VFD fire-house/picnic grounds and began the process of getting things ready for the picnic. The chief honcho deftly drug the brush hog around while his near neighbors weed ate and lawn mowed. New neighbors, the Georges (Joseph and Salina, Tristan, Harrison and Nickolas), joined in with Ms. McCleary, Chris Dailey and others to scrub to a bright shine all the cooking equipment. When fourteen people get together to do something, some things get done. They will be doing it again this Wednesday and, most likely, each Wednesday until the picnic is over and then maybe the following Wednesday just for the fun of it. Anyone in the fire district or anyone driving by is welcome to join in. The work starts at 5:00 p.m. and goes on until quitting time. The reward is that good feeling of being part of something worthwhile. All the rural fire departments are made up of volunteers. Some fight fires and do the dangerous work for which they train so rigorously and some work on the sidelines doing the other important things that have to be done to keep the vital outfit operating. A temporarily overwrought individual was heard to say one time a few years back, “This is not the Skyline Area Volunteer Fire Department Picnic Society!” It turns out, that for a few weeks in mid-summer every year, it is. Wednesdays at five—come join the fun. Linda’s Almanac from over at The Plant Place in Norwood says that the 25th through the 27th are good days for planting beets, carrots, radishes, turnips, peanuts and other root crops. They are also good for planting melons, cucumbers, pumpkins and other vine crops that can be planted now. The almanac says they will yield well. Those three days are good for transplanting as well as good days for weaning, hunting, fishing, and pruning to encourage growth. This full moon is called The Thunder Moon and a person born in July has the ruby for a birth stone. (There will probably be no shortage of rubies in the life of the royal baby about to be born on the hottest day in the UK in years. Congratulations in advance from the Champion News!) There has certainly been some thrilling thunder in recent nights, and compensation for not being able to see the enormous full moon comes in the rain gauge. Farmers and gardeners are happy. The rain has made earth working easier for people who enjoy spending their time with shovels. It might be a good time to rework some of the roads. The men from the County Shed at Drury stay busy and the list of projects the residents of the area have in mind is long. The process of prioritizing this work is probably more complicated than the average rural person with the rutted drive can imagine. One old Champion is complaining that it is too wet to mow. When it gets dry enough to mow he will complain about having to mow. A new lease on life is an expression used when one begins to realize success after a series of failures. Things look dismal and then get much better. The expression would seem to indicate that a person is just renting life– having temporary possession of it with the responsibility for taking care of it. An old farmer has some good advice about life: “Your fences need to be horse-high, pig-tight and bull-strong. Keep skunks and bankers at a distance. Life is simpler when you plow around the stump. A bumble bee is considerably faster than a John Deere tractor. Words that soak into your ears are whispered….not yelled. Meanness don’t jes’ happen overnight. Forgive your enemies; it messes up their heads. Do not corner something that you know is meaner than you. It don’t take a very big person to carry a grudge. You cannot unsay a cruel word. Most of the stuff people worry about ain’t never gonna happen anyway. Don’t judge folks by their relatives.” The old farmer has lots of advice. A migrant farmer advises, “Show your enemy the road to reconciliation.” A Champion advises, “When it is good, say so.” So Champions are happy with their lease on life. It is good and they are grateful. The always charming proprietor of the Historic Emporium over on the North Side of the Square reports brisk sales of tickets for the lovely quilt on display there. It is a queen sized beauty, brilliantly white and cross stitched with the “Tree of Life.” Examine the fine workmanship and get your name in the pot. While you are there, register your good advice or, if you must, your pithy complaint, out on the spacious veranda. You will be in excellent company, hobnobbing with the locals, catching up on the news, watching the grass grow. It might be a good time to sing, “Singing in the rain, just singing in the rain! What a wonderful feeling, I’m happy again!” In Champion!—Looking on the Bright Side! Champions are optimistic by nature and the idea of a little rain early in the week has some of them making preparations for it. Others are purposely not preparing, daring nature to rain on the clean clothes on the line or on the pie cooling on the windowsill. One calls it the “theory of positive and negative jinxing.” Rain or shine, Champions take what comes and make the most of it. One says, “Might as well, we can’t dance.” It is unclear whether dancing is not allowed or the individual is just incapable of dancing. The weather, however, does look clear and so Champions stay optimistic rain or shine. Reports are that it was hot and sunny on Friday for the Vanzant Picnic, but that Saturday was just delightful. A big band of clouds rolled in from the northeast; the temperatures were quite temperate and the humidity was low. It was perfect! Those volunteer firefighters from over at the Eastern Douglas County Volunteer Fire Department were out directing traffic in the most expeditious and efficient way. Polite, friendly young fellows kept it safe and a couple of other guys ran a golf cart shuttle for folks who had to park a distance away. The entertainment, the food and the games were all great, but the best part was seeing and visiting with friends and acquaintances that get together at this event every year. Ruby Proctor chose the right night to be out. Frankie and Freda accompanied her and she had a good time. Frances Banks said that the fish had come from a farm in Arkansas and that Gwen from down at the Drury Café had arranged for it through an outfit in Ava. Everyone held that it was just first-rate. Elvie Ragland enjoyed her fish dinner with her friend Linda Collins of Richfield and had some good stories to tell about her recent adventures over in Oklahoma. She said she has not been spending as much time as she would like out on the porch at the Historic Emporium in Champion, but figures that she will get over there soon. The General was in full Generalissimo Mode ramrodding and nattering and hobnobbing all to good effect. Mrs. Don Walker and her charming daughter were on hand selling those tickets for the drawings and greeting the arriving crowd with their sweet smiles. Sherry Lynch and her sweetheart were there selling tickets for the fifty/fifty drawing and someone alleged it was he who did such an excellent job of the National Anthem, though one person thought he said ‘truth through the night’ instead of ‘proof through the night.’ Bob Upshaw said that master of ceremonies, Steve Moody, is responsible for booking the talent for the program. He is quite a talented fellow himself and knows it when he sees it. Those Shannon sisters, Judy Wood and Yvonne Unger, kept the cake walk spinning and a great deal of excellent conversation ensued around that little numbered square of ground. Linda Clark won a lemon cake for her dad, Wayne Anderson, and Linda Kaye’s older sister had great luck and won three cakes during the evening, all of which she gave away. Champion! “I fell out of a barbed wire fence, straddle of a cherry tree and I tore myself from now until tomorrow morning. The Doctor said I wouldn’t live from one end to the other,” said Rufus Keller, according to his grandson, Larry Wrinkles, the other day. Larry said that his grandpa was full of riddles and limericks and stories of all kinds. One interesting one was about a couple of guys standing around talking when they saw a fellow coming up the road. One asked the other, “Who is that coming up the road.” His companion replied, “Brothers and sisters have I none, but that man’s father is my father’s son.” This is an old riddle, but it still works a hardship on some brains to figure it out. Hard work is no stranger to the Wrinkles clan. Teresa was busy in the cook shack at the Vanzant Picnic. She will work the Up ‘n At It 4-H Picnic in a couple of weeks and has pledged to help out at the Skyline Picnic as well. It will seem strange to have the quilt and door prize ticket table without Esther Wrinkles this year. Teresa sat with her mother-in-law there for many years and will carry on, a Champion. Esther had her 95th birthday last June. She would have been 96 this year. That is corrected information via Irene Dooms, Esther’s sister, and the other of Rufus Keller’s daughters. Irene will make some pies for the Skyline picnic, she says. It is always good to see her and her Champion and Skyline friends hope she will make it out this way often. Before Kenneth and Dawn Henson left to go back to Houston, they made it by Henson’s Grocery and Gas to buy some tickets for the beautiful quilt that will be given away at the Skyline Picnic this year. It is figured that since Hoovey only bought five dollars’ worth of tickets, he will not mind paying the shipping charges if he wins. He might ask someone to hold it for him (if he wins) and he will pick it up when he comes for the Champion School Reunion on the Saturday before Labor Day. He will have to win it first, and his few little tickets among the many will have to prove him to be luckier than experience has demonstrated so far. Well, he does have that lovely, sweet wife. Time will tell on August 10th. Ethan Alexander shares his birthday with his Uncle Zee on the 19th of July. Together they share their birthday with Samuel Colt, 1814; Edgar Degas, 1834, and Lizzie Borden, 1860. Ethan has a cousin named Lizzie. She is Uncle Zee’s daughter and she was born in 2007, on the 15th of May. She probably will learn about the other Lizzie eventually, but her family is not worried. When it comes to swimming across the pool, or figuring out a hard problem, or understanding things, she says, “I’ve got this!” And she means it. Her old Granddad says it is so. Lizzie’s Granddad is hoping the deer will stay out of his garden this year. Taegan’s folks are hoping the raccoons will stay out of the corn. It is pitiful to have a good crop just ready to harvest when the critters come along and reap it in advance. Live traps, shot guns, and good watch dogs might keep them at bay, but luck is a factor in there as well. Linda’s Almanac from over at The Plant Place in Norwood says that the 20th and 21st will be good for planting above-ground crops and the 23rd will be a lucky day for planting beets, carrots and other root crops. There is always something to do. Every now and then it is a good thing to take a break, a little rest, to catch up on a little visiting with friends and neighbors on the comfortable, spacious veranda of the Recreation of the Historic Emporium over on the North Side of the Square. Friends will look for Elvie there singing, “Luck be a Lady Tonight!” Take a break and enjoy your good luck to be in one of the world’s truly beautiful places…Champion—Looking on the Bright Side! “Truth, Justice and The American Way!” was the message scrawled on the bathroom wall and discovered after the last of the early summer guests had departed. The message was really written in a precise hand on a small slate hung on the wall in that little room and it caused the host to smile reflecting back on the pleasant hours of conversations concerning music, art, literature, philosophy, politics, religion, farming, gardening, engineering, innovation, health, health care and myriad other subjects. The pleasure derived from such pleasant visiting is one of life’s treasures. Champion! Dawn and Kenneth Henson surely had some of those great conversations while they were in town for the Mountain Grove Alumni gathering this week. The alumni celebration ties in nicely with the Fourth of July festivities. Saturday was the regular day for the parade and general get-together of people who have attended school there in past years going way back–way back. Dawn did not go to school there. She grew up in Tulsa and had six hundred people in her high school graduating class, which had its 50th reunion this year. She did not attend, saying that she does not feel as close to her own graduating class a she does to Kenneth’s in Champion and in Mountain Grove. She likes the friendly environment in these parts. The two of them spent some pleasant time on the wide veranda at the Champion Store on Sunday. The store was not open, but they still enjoyed a few minutes of leisure looking out over the tranquil scene. Dawn said that it had been 107˚F when they left Houston the other day, so it was not just family history that had them so glad to be back in Champion. They were going to spend some time Sunday afternoon with Uncle Deward Henson’s daughter, then head up to Springfield to visit with brother Royce Henson and his wife Jo. They planned a stop off in Arkansas on their way home to see a granddaughter perform in a school function there. When complimented on his apparent vigor and weight loss, Kenneth (Hoovie) credited his by-pass surgery. He said that he had blown his strict diet in a big way on this trip but that he will get back on the straight and narrow soon. Their Champion friends hope the straight and narrow will bring them back for the Champion School Reunion on the Saturday before Labor Day. “Is this the Information Bureau?” That was the opening salvo of the telephone conversation initiated by a prominent Champion who was calling to find out what he could do that day according to Linda’s Almanac. The July almanac was late in being posted on the bulletin board at Henson’s Downtown G & G and he could not figure out what to do. It turned out that the day he called and the subsequent day were perfect days for destroying weeds. He had been killing brush the day before so he felt like he was on the right track. The 14th through the 17th will be the next favorable days for planting, particularly for those crops that produce their yield above the ground. The almanac can be studied on the bulletin board in Champion, on the internet at www.championnews.us and over at The Plant Place in Norwood. It is nice to have a plan or to have the comfort of knowing you are doing the right thing at the right time. Sophia Zappler will have her eleventh birthday on the 13th of July. That is just about the time that Kate and William Winsor are expecting their royal baby. Maybe Sophia will share her birthday with a future queen. Ceiara Carroll will have her birthday on the 14th of July. She will be in the seventh grade at Skyline this fall. Summer is an excellent time for a birthday. Some friends celebrate Christmas time birthdays in the middle of the summer just to have the day be truly special. “Birthday” money should not necessarily have to be spent on other people at Christmas. While giving may indeed be the greatest joy, sometimes it takes a while to figure that out, and for a child or an adult receiving is also most pleasant. That is particularly true of a thoughtful gift. It takes practice to figure out just what might be the most wonderful thing to give to a friend or loved one. The thought behind the gift is decidedly more important than the amount of money spent on it. One old Champion grandmother thinks she will just start giving boxes of “Thank you” notes to grandchildren, who do not seem to have been taught the concept. Love and Gratitude go together like biscuits and gravy. Country musicians have written many songs about being thankful. Roy Clark sang, “Thank God and Greyhound Your Gone.” Kris Kristofferson wrote to God in his thank you song: “Thank you for that burning sun that’s rising golden in the air that smells so sweet. Thank you for that empty far horizon that opens to a new eternity.” Send your favorite thank you song to Thank You, Champion Items, Rt. 2, Box 367, Norwood, MO 65717 or to Champion @ getgoin.net. Better yet, make the trip down to the bottom of the hill on the wide, wooly banks of Old Fox Creek and sing your thank you song right out loud. Climb up the broad graceful steps of the Recreation of the Historic Emporium and turn to look out over one of the world’s truly beautiful places. Hold on to the porch rail with both hands as you express your jubilant joy and gratitude for being in Champion–Looking on the Bright Side! John Adams, Ben Franklin, George Washington and some other guys got together in Carpenter’s Hall in Philadelphia in 1774, to chat and conspire among themselves with the doors and windows closed against the Royalist spies. By the second of July 1776, they had moved to Independence Hall and John Adams kept yelling “Now is the time!” There was a thunderstorm going on. They got it figured out and here we are…. a big lusty Nation. Even back then Adams and others were concerned about the direction of the country and continually said that it was “going to Hell.” The country was in turmoil. It has always been in turmoil. It is the nature of the Nation to be in turmoil because it is an amalgam of the ‘melting pot,’ roiling with growing pains and optimism. Champion is the very seat of optimism in the very Heart of the Nation. Hurrah! for the Red White and Blue! “Now is the time!” said Harley to Barbara or Barbara to Harley on July 3rd forty eight years ago. So they tied the knot just before Independence Day, forever abandoning their individual independence for the joy of joining together “‘ till,” well, everybody knows “’till when.” For the most part, it seems to have worked out well. It is good for the city girl that her farm boy needs to go spend some time in the hay every year. That way, when he has had such a productive country sojourn away from her, and she, such a peaceful respite of freedom, they are again delighted with the sight of one another, just like the old days! Flowers, dinner out, lengthy conversations about their respective time alone make it all seem like it is starting all over again. They were young and the future stretched out before them endlessly. Romance is truly Champion. Congratulations. June Slipped away so quickly. Nick Massey had a birthday on the 25th and Dancing Nancy out Dogwood way celebrated on the 26th. Esther Wrinkles would have had her 95th on the 28th. Champion Eva Powell shared her birthday on the 29th with KZ88 Radio personality Butch Kara. Now it is July and a most pleasant curmudgeon up on the side of a hill rejoices that he has made it to yet another astounding number of years. Patrick Vincent, who will be a 4th grader at Skyline this fall, will have his birthday on the 3rd of July. Kyra Curtis has her birthday on the 6th. She will be in the 7th grade when school starts up again. Lyla Brown will be in kindergarten. Her birthday is on the 7th of July. The 14th Dali Lama will celebrate his 78th birthday on the 6th of July. He shares the date with Professor Daryl Haden formerly of Smallett, Missouri, and now of South Fulton, Tennessee. Of course, The United States of America celebrates its birthday on the 4th of July! The creeks will be full of revelers and the fun will be effervescent. Huzza! Singing “America the Beautiful” is definitely an exercise in spirit lifting. It is suggested that everyone give it a try out. Sing it out loud on the comfortable veranda at the top of the graceful steps overlooking the tranquil splendor of one of the world’s truly beautiful places. “O beautiful, for pilgrim feet/Whose stern, impassioned stress/ A thoroughfare for freedom beat/Across the wilderness!” to Champion—Looking on the Bright Side!